8/2 Cup of Coffee: It was a disappointing start to August, with only Lowell pulling out a win on Thursday. Portland fell in extra innings, while a Greenville comeback went for naught. Pawtucket continues to slide, and little went right for Salem, the GCL Red Sox or the DSL Red Sox. Pawtucket lost for the ninth time in its last 12 games, falling 6-2 to the Norfolk Tides (BAL). Starter Chris Hernandez rolled through the first four innings but hit a wall in the fifth, giving up three runs on three hits and a walk, while retiring only one batter before being lifted for Brock Huntzinger. Overall, Hernandez allowed three runs on four hits in 4 1/3, walking four and striking out a pair. He fell to 3-9 on the season. Huntzinger was solid in relief, firing off 1 2/3 hitless innings, while walking one and striking out three. Alex Wilson followed with his second rehab appearance, allowing one hit in a scoreless inning. In his second game back from an emergency appendectomy, Ryan-Rowland Smith understandably showed some rust. A key figure in the PawSox bullpen in the first half, the Australian lefty struck out three in 1 1/3 innings, but gave up three runs on three hits, including a solo home run. The PawSox generated only six hits against Norfolk pitching, with the two runs coming on a pair of solo shots by Dan Butler and Mark Hamilton. Butler continues to dominate at the plate, starting off August strong after finishing July with a .364/.464/.690 line. Xander Bogaerts continues to hit as well, ripping a double to left in the eighth inning. It was a tough loss for Portland, who fell 6-5 in extra innings to the Richmond Flying Squirrels (SF). After falling behind 4-1, the Sea Dogs rallied for a four-run seventh, led by a Matt Spring solo home run. It was Spring's 10th homer of the season in only 145 at-bats. However, Richmond rallied for one in the eighth to tie before walking off winners in the 10th. Keith Couch got the start, allowing four runs on eight hits in six innings. Noe Ramirez took his first loss in a Sea Dogs uniform in difficult fashion, allowing an unearned run to score in the 10th. The Flying Squirrels could not find a way to retire Shannon Wilkerson, who went 2 for 2 with two walks and two runs scored. Wilkerson even reached base on a throwing error when he tried to sacrifice in the seventh. After a fantastic first month in Double-A, Garin Cecchini is scuffling a bit. After going 0 for 3 last night, he is just 1 for 14 in his last five games. On the bright side, he walked twice last night and has earned six free passes during the skid. Salem dropped its series opener with the Lynchburg Hillcats (ATL), 5-0. The Red Sox had only four hits off of Lynchburg pitching, and two of those came off the bat of Blake Swihart. After going 2 for 4 with a double, the catcher has now hit safely in six straight. Heri Quevedo took the loss despite a solid effort, giving up four runs on six hits in six innings, striking out six while walking only one. Greenville fell in a 4-3 nail-biter to the Savannah Sand Gnats (NYM). Savannah got off to an early lead against Brian Johnson, who struggled for the Drive. Johnson was unable to find his control, throwing only 36 of his 74 pitches for strikes in three innings, while walking five and hitting a batter. In all, he allowed two runs on three hits. After falling behind 3-0, the Drive scratched for single runs in the fourth, fifth, and seventh innings to tie the game. Leading the way was Aneury Tavarez, who hit a solo homer in the fourth. Tavarez also notched his 25th double, tying him with Drew Turocy and the recently promoted David Chester for the team lead. Keaton Briscoe also had a good night at the plate, going 2 for 4 with a walk and a RBI. Kyle Martin took the loss in his first Greenville appearance despite a solid debut. Promoted from Lowell on Wednesday after a dominant stint with the Spinners, the ninth-round pick out of Texas A&M allowed a run on two hits in three innings, striking out one and walking one. The single win on the day went to Lowell, who downed the Auburn Doubledays (WAS), 7-1. Second-round pick Teddy Stankiewicz got the start. The tall right-hander allowed his first run, his first hits, and recorded his first strikeout as a professional. In two innings, he gave up the one run on three hits. He struck out four of the nine batters he faced, however, and has yet to walk a batter. Sergio Gomez (pictured) piggybacked Stankiewicz, and the lanky 19-year-old was dominant. Gomez gave up just one hit in six scoreless innings to earn the win. He struck out four and walked three. Greg Larson struck out the side in a perfect ninth inning to close out the win. The Spinners got excellent contributions from the bats as well. Nick Moore, entering the contest hitting only .158, went 3 for 4 with a run scored and a pair of RBI. Nathan Minnich added a double as part of a 2 for 3 night. Minnich also walked, scored one, and drove in a run. Williams Jerez, mired in a deep 5 for 37 slump, showed signs of breaking out with an RBI double. It was a tough match-up for the GCL Red Sox, who fell 3-1 to the GCL Orioles. The Red Sox lineup was helpless against O's first-rounder Hunter Harvey, who struck out the first five batters he faced and eight overall in his three hitless innings. Randy Perez was up for the challenge, however. Opposing Harvey, the 19-year-old allowed just one run on three hits in five innings, striking out five without issuing a walk. While the Red Sox recorded only three hits off of Orioles pitching, Iseha Conklin proved a thorn in their side, going 1 for 1 with a pair of walks. Sean Coyle continues to show the effects of two months off as he rehabs from a knee injury. The second baseman went 0 for 4 with three strikeouts and an error and is now just 1 for 14 in four rehab appearances in the GCL. After starting off 30-12, the DSL Red Sox have hit a rough patch. With yesterday's 7-3 loss to the DSL Indians, they have lost six of their last nine games, as they maintain a slim 1.5 game lead for first place in the North Division. Luis Ramos had his worst start of the season, giving up seven runs (four earned) on six hits in 4 1/3. It was the first time all season that Ramos had allowed more than three runs and only the third time he'd allowed more than one. There were several solid efforts at the plate despite the loss. 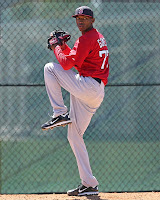 Ricardo Andujar entered in the midst of a difficult 4 for 57 slump that did not see him record a single extra-base hit. He broke out, delivering three hits, including a ninth-inning RBI double. Javier Guerra went 2 for 4 with a double, scoring two of the three Red Sox runs. The two-bagger was his first extra-base hit since June 29. Luis Alexander Basabe went 2 for 4 with a walk and scored the other Red Sox run. Player of the Day: Sergio Gomez was outstanding, earning the win for Lowell. He allowed just one hit in six shutout innings, lowering his ERA to 1.81 on the season. Signed out of Colombia in 2009, he is following up on a breakout 2012 when he was named a postseason Gulf Coast League All-Star.